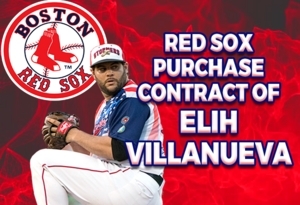 (Lancaster, Pa., June 3, 2017) - The Boston Red Sox have purchased the contract of Lancaster Barnstormers right-handed pitcher Elih Villanueva, it was announced today. He will be assigned to the Portland Sea Dogs of the Class AA Eastern League. He is the second member of the 2017 Barnstormers’ squad to leave for a Major League organization. Villanueva, 30, had made seven starts for the Barnstormers, posting an overall 5-1 record with a 2.73 ERA. He leaves the Atlantic League tied for the lead in wins and seventh in ERA. The Florida native had recorded wins in his last five decisions with a 2.25 ERA over the last six. Overall, he had struck out 32 and walked 10 in 36 1/3 innings. The right-hander spent seven seasons in the Miami Marlins organization, making one Major League start for the Marlins at Philadelphia in June, 2011. He was Class AA Southern League Pitcher of the Year in 2010, going 14-4 and also won 10 games for Class AAA New Orleans in 2014. Villanueva went to the Baltimore Orioles system in 2015, posting a 12-12 record between Class AA Bowie and Class AAA Norfolk. He missed all of last season after undergoing surgery in March. The Lancaster Barnstormers are entering their 13th season as a member of the Atlantic League of Professional Baseball. Home games are played at Clipper Magazine Stadium in downtown Lancaster, Pennsylvania. Please call 717.509.HITS (4487) or visit www.lancasterbarnstormers.com for more information.